A modern roller coaster showing an inverted portion of the trip. Although targets of bullies often use the roller coaster metaphor for its evocation of the "up and down" of being the target of a bully, the metaphor is much more useful than that. Roller coasters produce in their riders an overwhelming sense of fear. Even though they progressively slow down after their first hill, the experience of fear never lets up, and in the best coasters, it builds throughout the trip. They accomplish this by using ever-tighter turns, inversion, and view management to create a heightened sense of fear as the ride proceeds. 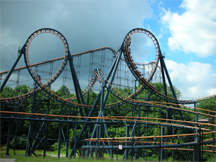 Fear management is the essence of the coaster designer's art. Bullies do exactly the same thing. Last time, we began our exploration of how workplace bullies use the OODA Model by noticing that most bullies are very intuitive about it. And we gained some insight into how bullies select targets, and how targets can respond. Let's now consider how bullies use the OODA model for shaping the dynamics of the environment in which they work. Bullies understand that a high tempo of attacks can overwhelm targets. By getting inside their targets' OODA loops, they reduce the effort required to maintain the advantage. Since workplace bullies also understand that targets who feel hopeless are more likely to quit their jobs, bullies relent when they sense that their targets are near their breaking points. Targets often report a feeling of being "on a roller coaster" of emotion, as they experience this alternation of intensity levels of bullying. The variation of intensity itself wears on targets. Some cease all efforts to resist, resigning themselves to just finding a way to endure. Bystanders are often intimidated, too, as they witness the bully's power to destroy targets. Targets who understand and expect this alternation of intensity levels are better able to maintain emotional control. They won't relax as much during low-intensity phases, and they won't lose all hope during high-intensity phases. They also understand that their bullies use the targets' own responses to gauge what level of intensity would be most effective. From the bully's perspective, environmental shaping requires paying attention to the activities of many people. First, there are the targets themselves. But there are also bystanders, supervisors, and miscellaneous officials. activities of many peoplebystanders might report the workplace bully's activities to officials, bullies seek to intimidate bystanders, or better, to convert them into compliant allies. Since supervisors can also be threats, bullies either mollify them with bribes of performance, or threaten them directly or indirectly. They often employ deception to confuse the supervisor, and they carefully monitor the supervisor's state of mind. They must also monitor, deceive or control other organizational officials, who tend to be less trouble since they're usually more distant. Since the environment surrounding the bully can be very complex, the bully tries to simplify the situation by limiting the number of players involved, or by deceiving them about the nature of the bullying activity. Undermining the bully's deceptions is therefore a profitable strategy for targets, because it adds complexity to the overall problem the bully must solve. Would you like to see your comments posted here? rbrenmsuldgGhmlLejqzmner@ChacJfTyfUEvaOLYteecoCanyon.comSend me your comments by email, or by Web form. I offer email and telephone coaching at both corporate and individual rates. Contact Rick for details at rbrenXtWfvhYNZvsGQtsjner@ChacsYdQOUDNkrgtVcLJoCanyon.com or (650) 787-6475, or toll-free in the continental US at (866) 378-5470.